Stable growth through new buisness models. The exhibition industry is enjoying solid, stable growth on the global scale. 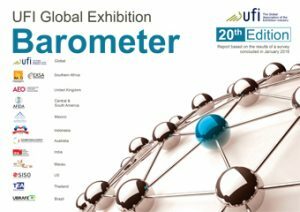 The exhibition industry is enjoying solid, stable growth on the global scale – this is one of the core results of the 20th edition of our UFI Global Exhibition Barometer, released at the end of January. 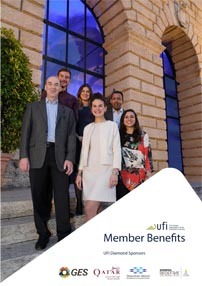 To honour the jubilee edition we added something special to the global research – and looked for a measure that describes how the business model of exhibitions is changing. The answers are encouraging, as they show that, all around the world, the exhibition industry is investing into new opportunities outside of the repetitive current activities. Many companies around the world state that one of their strategic priorities is to develop revenue from new business models. Different event formats, digital revenues, or marketing services are listed as opportunities among others. So we asked companies around the world to share what percentages of their annual revenue they expect to generate from new business models in the future. With around 300 companies from more than 50 countries replying, we can share a proper global picture. The answers show that the industry is embracing a fast development of new opportunities, and expect new types of business to grow into a relevant source of income within just a few years. Globally, 63% of participating companies expect between 5% and 25% of their revenues to come from new business models 5 years from now. 11% even expect this share to be higher than 25%, while 19% expect it to be between 0% and 5%. 8% of the participating companies did not share their expectation. Looking ten years ahead, 51% of companies expect this share from new business models to be 10% and more, with 24% expecting more than one quarter of future revenue growth to come from new business models. Only 21% of participating companies expect the share to be below 10%. For this timeframe, however, 26% said that they cannot make a projection yet. The full Barometer also includes 17 market profiles, covering all the major exhibition markets. 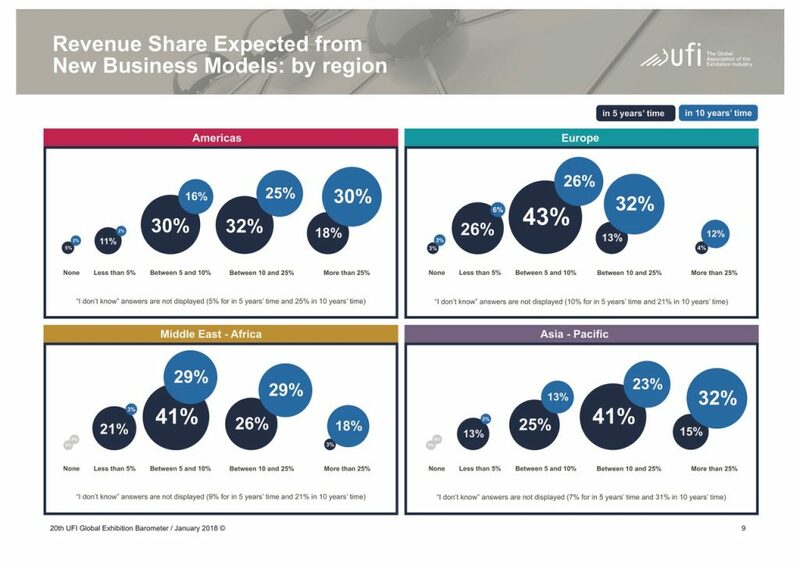 Five markets stand out as most optimistic about new business model revenues in the coming five years: the US (73%), India (73%), Macau (69%), Thailand (67%), and Australia (63%). Over the ten year period, Chinese companies are by far the most optimistic. So it seems that exhibition organisers, venues, and service providers are not resting on their laurels, as the industry benefits from the aligned economic growth in the world’s leading markets. Instead, it is adapting to a changing environment, and looking to monetise on new opportunities.